Atletico Madrid forward Diego Costa has been banned for eight games by La Liga after verbally abusing the referee during Saturday's defeat to Barcelona. The suspension means the Spaniard will miss the rest of the season, as Atletico Madrid have just seven matches left to play. 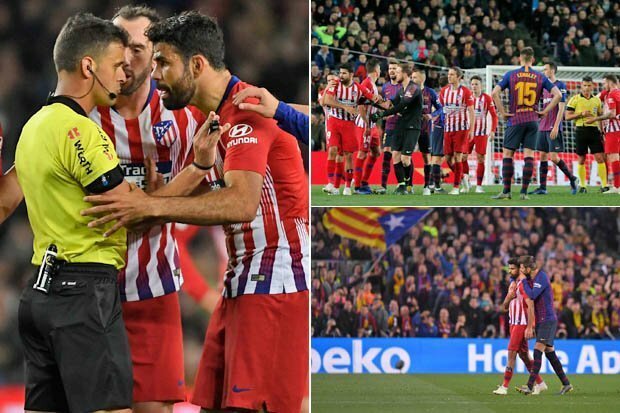 Diego Costa was shown the red card for insulting referee Gil Manzano after 28 minutes of their trip to Barcelona. Manzano also reported that Costa had ''grabbed'' him by the arms during the incident.